Noah's autobiographical comedy book Born a Crime was published in 2016 and garnered critical acclaim. Noah was named one of "The 35 Most Powerful People in New York Media" by The Hollywood Reporter in 2017 and 2018. In 2018, Time magazine named him one of the 100 most influential people in the world. Trevor Noah was born on 20 February 1984 in Johannesburg, South Africa. His father Robert is of Swiss German ancestry, and his mother, Patricia Nombuyiselo Noah, is of Xhosa ancestry. She converted to Judaism when he was 10 or 11 years old, but did not have him convert, although she introduced him to some aspects and practices of Judaism. Under apartheid legislation, Noah's mother was classified as Black, and his father was classified as White. Noah himself was classified as Coloured. His parents' interracial relationship was illegal at the time of his birth under apartheid law. Interracial sexual relations and marriages were not decriminalized until the amended Immorality Act of 1985, a year after Noah's birth. Noah's mother was jailed and fined by the South African government. Patricia and her mother, Nomalizo Frances Noah, raised Trevor in the black township of Soweto. Noah spent his early youth at the private Maryvale College (at the age of three he started pre school, at the age of five he went to primary school), a Catholic school in Johannesburg. During his childhood, he attended Roman Catholic church every Sunday. In 2002, aged eighteen, Noah had a small role on an episode of the South African soap opera Isidingo. He then began hosting his own radio show Noah's Ark on Gauteng's leading youth radio station, YFM. Noah dropped his radio show and acting to focus on comedy, and has performed with South African comedians such as: David Kau, Kagiso Lediga, Riaad Moosa, Darren Simpson, Marc Lottering, Barry Hilton, and Nik Rabinowitz, international comedians such as Paul Rodriguez, Carl Barron, Dan Ilic, and Paul Zerdin, and as the opening act for American comedian Gabriel Iglesias in November 2007 and Canadian comedian Russell Peters on his South African tour. Noah went on to host an educational TV programme, Run the Adventure (2004–2006) on SABC 2. In 2007, he hosted The Real Goboza, a gossip-themed show on SABC 1, and Siyadlala, a sports show also on the SABC. In 2008, Noah co-hosted, alongside Pabi Moloi, The Amazing Date (a dating gameshow) and was a Strictly Come Dancing contestant in the fourth series. In 2009, he hosted the 3rd Annual South Africa Film and Television Awards (SAFTAs) and co-hosted alongside Eugene Khoza on The Axe Sweet Life, a reality competition series. In 2010, Noah hosted the sixteenth annual South African Music Awards and also hosted Tonight with Trevor Noah on MNet (for the second series, it moved to DStv's Mzansi Magic Channel). In 2010, Noah also became a spokesperson and consumer protection agent for Cell C, South Africa's third-largest mobile phone network provider. Noah has performed all over South Africa in The Blacks Only Comedy Show, the Heavyweight Comedy Jam, the Vodacom Campus Comedy Tour, the Cape Town International Comedy Festival, the Jozi Comedy Festival, and Bafunny Bafunny (2010). His stand-up comedy specials in South Africa include The Daywalker (2009), Crazy Normal (2011), That's Racist (2012), and It's My Culture (2013). In 2011, he relocated to the United States. On 6 January 2012, Noah became the first South African stand-up comedian to appear on The Tonight Show; and, on 17 May 2013, he became the first to appear on Late Show with David Letterman. Noah was the subject of the 2012 documentary You Laugh But It's True. The same year, he starred in the one-man comedy show Trevor Noah: The Racist, which was based on his similarly titled South African special That's Racist. On 12 September, Noah was the Roastmaster in a Comedy Central Roast of South African Afrikaans singer Steve Hofmeyr. In 2013, he performed the comedy special Trevor Noah: African American. On 11 October 2013, he was a guest on BBC Two's comedy panel show QI. On 29 November 2013, he was a panelist on Channel 4 game show 8 Out of 10 Cats and appeared on Sean Lock's team in 8 Out of 10 Cats Does Countdown on 12 September 2014. In December 2014, Noah became a recurring contributor on The Daily Show. On 30 March 2015, Comedy Central announced that Noah would succeed Jon Stewart as host of The Daily Show; his tenure began on 28 September 2015. Within hours after announced as Stewart's successor, attention was drawn on the Internet to jokes that Noah had posted on his Twitter account, some of which were criticised as being offensive to women, and others as anti-Semitic or to be making fun of the Holocaust. Noah responded by tweeting, "To reduce my views to a handful of jokes that didn't land is not a true reflection of my character, nor my evolution as a comedian." 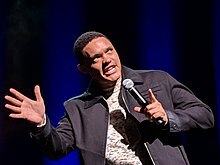 Comedy Central stood behind Noah, saying in a statement, "Like many comedians, Trevor Noah pushes boundaries; he is provocative and spares no one, himself included... To judge him or his comedy based on a handful of jokes is unfair. Trevor is a talented comedian with a bright future at Comedy Central." Mary Kluk, chairperson of the South African Jewish Board of Deputies (SAJBD), said that the jokes were not signs of anti-Jewish prejudice and that they were part of Noah's style of comedy. Noah's debut received positive reviews. James Poniewozik of The New York Times praised Noah and the show's writers saying, "Mr. Noah's debut was largely successful, it was also because of the operating system - the show's writing - running under the surface". Robert Lloyd of the Los Angeles Times described Noah as "Charming and composed - almost inevitably low-key compared with the habitually antic and astonished Stewart." Noah's success on the show has led to three stand-up specials on Comedy Central and Netflix. On 14 September 2017, it was announced that Comedy Central had extended Noah's contract as host of The Daily Show for five years, through 2022. He will also produce and host annual end-of-year specials for Comedy Central. In April 2017, it was announced that Noah was developing a talk-show for Jordan Klepper. On July 2017, the show's title was revealed to be The Opposition with Jordan Klepper and premiered on 25 September 2017. On 15 June 2018, Comedy Central announced that it was canceling the show after one season, but that Klepper would be hosting a new primetime weekly docuseries, Klepper. The series will premiere on 9 May 2019. In February 2018, it was announced that Noah will be executive producing a show with Roy Wood Jr. titled Jefferson County: Probation. In March 2018, Noah signed a multiyear contract with Viacom that gives first-look rights to any future projects by Noah, be they television, feature films or shortform video content. In addition to the deal, Noah will also be launching an international production and distribution company called Day Zero Productions. In January 2016, it was announced that Noah signed a book deal with Spiegel & Grau. His book, Born a Crime, was published on 15 November 2016 and was received favorably by major U.S. book reviewers. It became a #1 New York Times Bestseller and was named one of the best books of the year by The New York Times, Newsday, Esquire, NPR, and Booklist. It was announced that a film adaptation based on the book will star Lupita Nyong'o as Trevor's mother Patricia. She will also serve as the film's co-producer alongside Noah. In February 2018, it was announced that Noah would write a second book. In 2018, Noah and The Daily Show writing staff would release The Donald J. Trump Presidential Twitter Library, a book comprising hundreds of Trump tweets and featuring a foreword by Pulitzer Prize-winning historian Jon Meacham. In 2017, he made an appearance on Nashville. In 2018, he also made appearances in Black Panther and American Vandal. Noah has said of his comedic influences, "The kings are indisputable. Richard Pryor, [Bill] Cosby; for me personally I didn't know of him before I started comedy but Eddie Murphy changed my view on the thing and I definitely look up to him as a comedic influence. Chris Rock in terms of the modern black comedian and Dave Chappelle. Those are the guys that have laid the foundation and have moved the yardstick for all comedians, not just Black comedians." He also cited Jon Stewart as an influence and a mentor, following his appointment to succeed Stewart as host of The Daily Show. In an interview with The New York Times, Noah likened Stewart to "a Jewish Yoda" and recounted advice Stewart gave him, saying, "The most amazing thing that Jon did was he didn’t give me a mandate. He didn’t say, 'You need to make my show.' He specifically said: 'Make your show. Make your best version of it.' I apply those teachings of Jon’s to everything that I’m doing." Among comedians who say they were influenced by Noah are Michelle Wolf and Jordan Klepper. Noah's mixed-race ancestry, his experiences growing up in Soweto, and his observations about race and ethnicity are leading themes in his comedy. Noah is a polyglot; he speaks English, Xhosa, Zulu, Sotho, Tswana, Tsonga, Afrikaans, and German. In 1992 Noah's mother Patricia Nombuyiselo was married to Ngisaveni Abel Shingange, and they had two sons together, Andrew and Isaac. Trevor and his mother were both physically abused by Shingange, and the couple legally divorced in 1996. In 2009, after she married Sfiso Khoza, Shingange shot her in the leg and through the back of the head; she survived as the bullet went through the base of her head, avoiding the spinal cord, brain, and all major nerves and blood vessels, then exiting with minor damage to her nostril. When Noah confronted him over the phone about the shooting, Shingange threatened his life, prompting Noah to leave Johannesburg for Los Angeles. In 2011, Shingange was convicted of attempted murder, and sentenced the following year to three years of correctional supervision. Noah stated that he hoped the attention surrounding the incident would raise awareness of the broader issue of domestic violence in South Africa: "For years my mother reached out to police for help with domestic abuse, and nothing was ever done. This is the norm in South Africa. Dockets went missing and cases never went to court." Noah has described himself as being progressive and having a global perspective. However, he has clarified that he considers himself a "progressive person", but not a "political progressive" and prefers not to be categorized as being either right or left in the context of US partisanship. Gabriel Iglesias Presents Stand Up Revolution Himself Episode: "2.1"
Nashville Himself Episode: "Fire and Rain"
2018 American Vandal Himself Episode: "The Brownout"
Noah, Trevor (2016). Born a Crime: Stories from a South African Childhood. Spiegel & Grau. ISBN 978-0399588174. The Donald J. Trump Presidential Twitter Library. Spiegel & Grau. 2018. ISBN 978-1984801883. ^ a b "Trevor Noah – Actor Profile". Tvsa.co.za. Retrieved 4 November 2012. ^ a b "Tonight with Trevor Noah". Beta.mnet.co.za. 1 April 2007. Archived from the original on 18 August 2010. Retrieved 4 November 2012. ^ Shaw, Lucas (15 September 2017). "'The Daily Show' Host Trevor Noah Lands New Deal After Ratings Success". Bloomberg. Retrieved 22 April 2018. ^ a b Kakutani, Michiko (28 November 2016). "'Born a Crime,' Trevor Noah's Raw Account of Life Under Apartheid". The New York Times. Retrieved 18 March 2017. ^ a b Darden, Jeneé (18 February 2017). "Born a Crime: A Memoir of Love, Hope, and Resistance". Los Angeles Review of Books. Retrieved 18 March 2017. ^ a b Seymour, Gene (14 November 2016). "Trevor Noah recalls childhood under apartheid in new memoir". USA Today. Retrieved 18 March 2017. ^ a b "Born a Crime by Trevor Noah". Penguin Random House. Archived from the original on 1 October 2016. Retrieved 18 March 2017. ^ "The 35 Most Powerful People in New York Media". The Hollywood Reporter. 13 April 2017. Archived from the original on 20 April 2013. Retrieved 6 December 2017. ^ "The 35 Most Powerful People in New York Media". The Hollywood Reporter. 12 April 2018. Archived from the original on 20 April 2013. Retrieved 20 June 2018. ^ "Trevor Noah". Time. 19 April 2018. Archived from the original on 20 April 2018. Retrieved 19 April 2018. ^ Wemple, Erik (31 March 2015). "New 'Daily Show' host tweeted a 'fat-chick joke' at age 27!". The Washington Post. Archived from the original on 13 June 2015. Retrieved 11 April 2015. ^ Odhiambo, Tom (28 April 2017). "Trevor Noah: The making of a global star from Mama's Boy". Daily Nation. Retrieved 28 March 2018. ^ a b Gross, Terry (22 November 2016). "Trevor Noah Says He Grew Up 'In The Shadow Of A Giant' (His Mom)". NPR. Retrieved 18 January 2017. ^ Noah, Trevor (1 August 2017). Summary of Born a Crime: Stories from a South African Childhood by Trevor Noah. BookHabits. ISBN 978-1-537-86707-6. ^ "Ep. 55 – interview with South African comedian Trevor Noah". All Things Comedy. Archived from the original on 2 April 2015. Retrieved 30 March 2015. ^ "Trevor Noah's tough upbringing in Soweto will help him: granny". The New Age. 2 April 2015. Archived from the original on 7 April 2015. Retrieved 11 April 2015. ^ a b c Itzkoff, Dave (30 March 2015). "Trevor Noah to Succeed Jon Stewart on 'The Daily Show'". The New York Times. Retrieved 11 April 2015. ^ a b Armstrong, Stephen (16 December 2012). "Heard the one about the Swiss South African?". Sunday Times Culture magazine. pp. 12–13. ^ Laws, Roz (22 November 2013). "South African comedian Trevor Noah to play Birmingham's Glee Club". Birmingham Post. Retrieved 30 March 2015. ^ "Daily Show host Trevor Noah's stepfather tried to hunt and kill him". Daily Mail. ^ "Bafunny Bafunny official website". Archived from the original on 3 January 2013. Retrieved 4 November 2012. ^ "Tell Trevor — Cell C South Africa". Cellc.co.za. Retrieved 4 November 2012. ^ "Bafunny, Bafunny". Royal Albert Hall. Archived from the original on 5 February 2010. Retrieved 12 October 2013. ^ "Review: Bafunny Bafunny is a Winner". What's on in Cape Town. Retrieved 12 October 2013. ^ a b c Sidimba, Loyiso (11 March 2011). "Trevor Noah 'fled' to Hollywood". Channel24.co.za. Retrieved 11 April 2015. ^ Leno, Jay. "The Tonight Show with Jay Leno – Episode Guide". NBC. Retrieved 4 November 2012. ^ Meyer, David Paul. "You Laugh But It's True". Retrieved 30 March 2015. ^ "Trevor Noah: The Racist – review". The Guardian. London. Retrieved 12 October 2013. ^ "War of words erupts after Hofmeyr's roast". City Press. South Africa. 15 September 2012. Archived from the original on 25 December 2012. Retrieved 2 April 2015. ^ "Showtime : Trevor Noah: African American". Archived from the original on 8 June 2013. Retrieved 12 October 2013. ^ "QI, Series K, Killers". BBC. Retrieved 12 October 2013. ^ Chamber's Management [@ChambersMgt] (29 November 2013). ". @jimmycarr is your hilarious host for 8 Out 10 Cats again tonight with international stand-up star . @Trevornoah as guest panelist. C4, 9pm!" (Tweet). Retrieved 12 September 2014 – via Twitter. ^ Weinstein, Shelli (10 October 2014). "'The Daily Show' Adds Comedians Hasan Minhaj and Trevor Noah". Variety. Retrieved 19 November 2014. ^ Itzkoff, Dave (31 March 2015). "Trevor Noah, New 'Daily Show' Host, Comes Under Scrutiny for Tweets". The New York Times. Archived from the original on 20 April 2013. Retrieved 31 March 2015. ^ Bacrdi, Francesca (31 March 2015). "New Daily Show Host Trevor Noah Faces Backlash Over Controversial Tweets". E!. Archived from the original on 20 April 2013. Retrieved 31 March 2015. ^ Gambino, Lauren (31 March 2015). "Daily Show's Trevor Noah under fire for Twitter jokes about Jews and women". The Guardian. Archived from the original on 20 April 2013. Retrieved 18 March 2017. ^ Vultaggio, Maria (31 March 2015). "Trevor Noah Issues Non Apology For Offensive Jewish Jokes, Slams Critics". International Business Times. Archived from the original on 20 April 2013. Retrieved 1 April 2015. ^ "Comedy Central Stands Behind Trevor Noah, New 'Daily Show' Host, Amid Scrutiny". The New York Times. 31 March 2015. Archived from the original on 20 April 2013. Retrieved 1 April 2015. ^ Pillay, Taschica (6 April 2015). "Trevor Noah's 'playful' jokes don't offend us – SA Jews". Times Live. Archived from the original on 20 April 2013. Retrieved 7 April 2015. ^ "The Daily Show with Trevor Noah (2015–)". Rotten Tomatoes. Archived from the original on 17 August 2015. Retrieved 5 November 2017. ^ Poniewozik, James (29 September 2015). "Review: Trevor Noah Keeps 'Daily Show' DNA in Debut". The New York Times. Archived from the original on 5 June 2015. Retrieved 5 November 2017. ^ Lloyd, Robert (28 September 2015). "Review Comfortable, confident Trevor Noah takes over as host of 'The Daily Show' ... and survives". Los Angeles Times. Archived from the original on 13 October 2014. Retrieved 5 November 2017. ^ "Daily Show host Trevor Noah getting Comedy Central stand-up special". Entertainment Weekly's EW.com. ^ Sandberg, Bryn Elise (24 January 2017). "Netflix Sets Trevor Noah Comedy Special 'Afraid of the Dark'". The Hollywood Reporter. Archived from the original on 13 October 2014. Retrieved 5 November 2017. ^ Colburn, Randall (22 October 2018). "Trevor Noah recruits baby in chicken costume to help him announce new Netflix standup special". The A.V. Club. Archived from the original on 11 November 2018. Retrieved 11 November 2018. ^ Itzkoff, Dave (14 September 2017). "Trevor Noah Extends Comedy Central Contract Through 2022". The New York Times. Retrieved 23 September 2017. ^ Itzkoff, Dave (4 April 2017). "Jordan Klepper of 'The Daily Show' Is Getting His Own Show". The New York Times. Retrieved 4 April 2017. ^ Moraes, Lisa de (25 July 2017). "'The Daily Show' Spinoff Starring Jordan Klepper Gets Title & Premiere Date on Comedy Central – TCA". Deadline Hollywood. Archived from the original on 20 April 2013. Retrieved 26 July 2017. ^ Maglio, Tony (15 June 2018). "Comedy Central Cancels 'The Opposition' – But Orders New Jordan Klepper Series". The Wrap. Archived from the original on 15 June 2018. Retrieved 15 June 2018. ^ Wright, Megh (26 March 2019). "Jordan Klepper's New Comedy Central Show Debuts in May". Vulture. Archived from the original on 15 April 2019. Retrieved 10 April 2019. ^ Petski, Denise (12 February 2018). "Roy Wood Jr. To Star In Parole Officer Comedy From Trevor Noah & Aaron McGruder In Works At Comedy Central". Deadline Hollywood. Archived from the original on 12 February 2018. Retrieved 12 February 2018. ^ Andreeva, Nellie (4 April 2019). "Comedy Central Inks First-Look Deal With Roy Wood Jr. For TV & New Media, Orders His Pilot 'Jefferson County: Probation'". Deadline Hollywood. Archived from the original on 15 April 2019. Retrieved 15 April 2019. ^ Sandberg, Bryn Elise (26 March 2018). "Trevor Noah Inks Film and TV Deal With Viacom (Exclusive)". The Hollywood Reporter. Archived from the original on 11 February 2015. Retrieved 15 February 2015. ^ Italie, Hillel (26 January 2016). "Trevor Noah writing book of personal essays due in November". Associated Press. Archived from the original on 13 October 2014. ^ N'Duka, Amanda (21 February 2018). "Lupita Nyong'o To Star In 'Born A Crime' Based On Trevor Noah's Memoir". Deadline Hollywood. Retrieved 21 February 2018. ^ Petski, Denise (1 February 2018). "Trevor Noah's Follow-Up To 'Born A Crime' Memoir Bought By Spiegel & Grau Imprint". Deadline Hollywood. Archived from the original on 4 June 2016. Retrieved 24 February 2018. ^ "The Donald J. Trump Presidential Twitter Library by The Daily Show with Trevor Noah". Penguin Random House. Archived from the original on 4 June 2016. Retrieved 2 May 2018. ^ Kinane, Ruth (9 March 2017). "Nashville recap: 'Fire and Rain'". Entertainment Weekly. Archived from the original on 23 May 2018. Retrieved 10 March 2017. ^ Bonomolo, Cameron (21 May 2018). "Trevor Noah Had a Secret Cameo in 'Black Panther' That Fans Just Now Noticed". ComicBook.com. Archived from the original on 23 May 2018. Retrieved 23 May 2018. ^ Tallerico, Brian (14 September 2018). "American Vandal graduates from dicks to poop in its 2nd-season premiere". The A.V. Club. Archived from the original on 23 May 2018. Retrieved 19 September 2018. ^ "New & Next: Meet South African Comedian Trevor Noah". Essence. 14 June 2013. Retrieved 30 March 2015. ^ "Trevor Noah to succeed Jon Stewart as host of The Daily Show". The Guardian. 30 March 2015. Retrieved 30 March 2015. ^ Itzkoff, Dave (23 September 2017). "Trevor Noah on 'The Daily Show' and His 'Jewish Yoda,' Jon Stewart". The New York Times. Retrieved 6 November 2017. ^ Wax, Jamie (28 April 2018). "Comedian Michelle Wolf says it's "cowardly" for Trump to skip Correspondents' dinner". CBS News. Archived from the original on 24 March 2016. Retrieved 29 April 2018. ^ Neophytou, Nadia (26 December 2017). "Trevor Noah Puts on Executive Producer Hat for New Show". Eyewitness News. Archived from the original on 24 March 2016. Retrieved 13 December 2017. ^ "Why mixed-race comic was 'born a crime'". CNN. Retrieved 12 October 2013. ^ "Trevor Noah interview – Comedy interviews". Time Out London. Retrieved 12 October 2013. ^ Laws, Roz (22 November 2013). "South African comedian Trevor Noah to play Birmingham's Glee Club". Birmingham Post. ^ Vorster, Robyn Wolfson (27 February 2017). "The deadly power of patriarchy". Daily Maverick. Retrieved 20 October 2017. ^ "Comedian's stepdad shot mother". IOL. Retrieved 19 February 2016. ^ "Trevor Noah's hell at home". City Press. 3 March 2012. Archived from the original on 14 December 2012. Retrieved 11 April 2015. Noah, in an interview with Ezra Klein (podcast here) said that the incident has been tabloidised and implied that his move to the United States was not caused by it. ^ Moore, Frazier (31 March 2015). "'Daily Show' host Noah discusses his new gig". Associated Press. Retrieved 31 March 2015. ^ "The nominees for South African Savanna Comic's Choice Awards 2014 are..." Channel24.co.za. 5 June 2014. Retrieved 3 April 2015. ^ "Mafikizolo, Uhuru, Davido lead nominations for MTV Africa Music Awards". Sowetan Live. 17 April 2014. Retrieved 17 April 2014. ^ "2015 MTV AFRICA MUSIC AWARDS WINNERS!". MTV Africa Music Awards. 18 July 2015. Archived from the original on 21 July 2015. Retrieved 27 August 2015. ^ "Nominees". NAACP Image Awards. Archived from the original on 28 August 2016. Retrieved 27 December 2015. ^ Lincoln, Ross A. (14 November 2016). "Critics' Choice TV Nominations Unveiled". Deadline Hollywood. Archived from the original on 20 April 2013. Retrieved 14 November 2016. ^ Wood, Leighann (22 January 2017). "Trevor Noah Receives Zora Neale Hurston Award". Rusa Update. Retrieved 22 January 2017. ^ Hill, Libby (14 December 2016). "'Moonlight,' 'Birth of a Nation' and 'Loving' score big with NAACP Image Award nominations". Los Angeles Times. Archived from the original on 20 April 2013. Retrieved 14 December 2016. ^ "2017 Writers Guild Awards Television, New Media, News, Radio, & Promotional Writing Nominations Announced" (Press release). Los Angeles and New York: Writers Guild of America. 5 December 2016. Archived from the original on 28 March 2017. Retrieved 5 December 2016. ^ Regter, Shimoney (12 March 2017). "Trevor Noah Wins Fave African Star at Nickelodeon Kids' Choice Awards". Eyewitness News. Archived from the original on 20 April 2013. Retrieved 12 March 2017. ^ Lawrence, Derek (6 May 2017). "Debra Messing, 'Daily Show' among winners at GLAAD Media Awards". Entertainment Weekly. Archived from the original on 20 April 2013. Retrieved 7 May 2017. ^ Bell, Crystal (6 April 2017). "Here Are Your 2017 MTV Movie & TV Awards Nominations: See The Full List". MTV. Archived from the original on 20 April 2013. Retrieved 6 April 2017. ^ a b "Trevor Noah". Academy of Television Arts & Sciences/National Academy of Television Arts and Sciences. Archived from the original on 19 April 2012. Retrieved 13 September 2017. ^ "But Seriously ... Trevor Noah Wins Thurber Humor Award". U.S. News & World Report. Associated Press. 2 October 2017. Archived from the original on 20 April 2013. Retrieved 2 October 2017. ^ Haring, Bruce (20 November 2017). "NAACP Image Awards Nominees: Netflix, OWN Lead In TV; Universal, Annapurna, Open Road Top Film". Deadline Hollywood. Archived from the original on 20 April 2013. Retrieved 20 November 2017. ^ "2018 Writers Guild Awards: Television, New Media, News, Radio/Audio, & Promotional Writing Nominations Announced" (Press release). Los Angeles and New York: Writers Guild of America. 7 December 2018. Archived from the original on 4 January 2018. Retrieved 7 December 2017. ^ Kilday, Gregg (19 January 2018). "GLAAD Media Awards: The Complete List of Nominees". The Hollywood Reporter. Archived from the original on 20 April 2013. Retrieved 19 January 2018. ^ Nordyke, Kimberly (5 September 2018). "People's Choice Awards: 'Black Panther,' 'This Is Us' Among Nominees". The Hollywood Reporter. Archived from the original on 20 April 2013. Retrieved 24 September 2018. ^ Kilkenny, Katie (3 January 2019). "'The Favourite,' 'Pose,' 'Killing Eve' Lead Dorian Award Nominations". The Hollywood Reporter. Archived from the original on 4 January 2019. Retrieved 3 January 2019. ^ Pond, Steve (4 January 2019). "Producers Guild Awards Nominations Include 'Roma,' 'Black Panther,' 'A Star Is Born' – and Also 'Crazy Rich Asians'". TheWrap. Archived from the original on 4 January 2019. Retrieved 4 January 2019. ^ Hipes, Patrick (13 February 2019). "NAACP Image Awards Nominees: 'Black Panther', 'Beale Street', Netflix, HBO Top List". Deadline Hollywood. Archived from the original on 13 February 2019. Retrieved 13 February 2019. This page was last edited on 25 April 2019, at 02:46 (UTC).